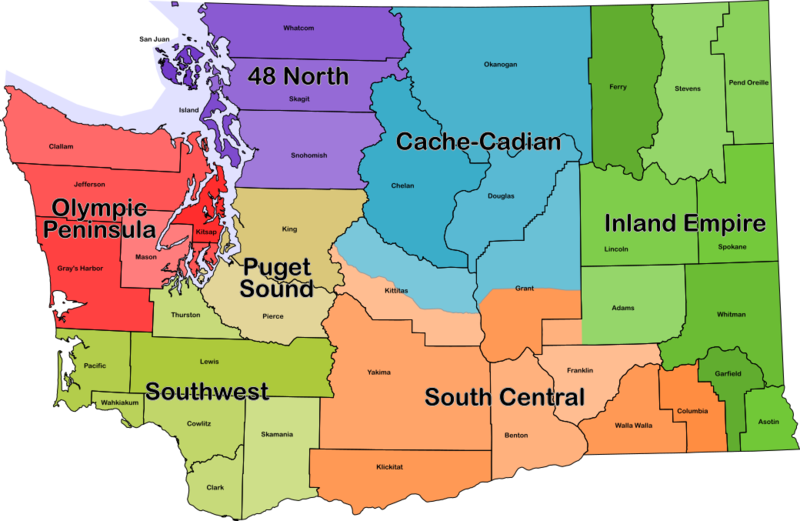 WSGA is divided into regional chapters. Members of each chapter elect a Chapter Representative annually, who represents them as a voting member of the WSGA Board of Directors, plans chapter events, and keeps members informed about WSGA activities. Puget Sound Chapter: Central and South Puget Sound – King and Pierce (east of the Tacoma Narrows) counties. 48 North Chapter: Northwest Washington above 48 degrees latitude – Snohomish, Skagit, Whatcom, Island, and San Juan counties. Cache-Cadian Chapter: Central Washington north of I-90. Based in Wenatchee; includes Chelan, Okanogan, and Douglas counties, plus northern Kittitas and Grant counties. Inland Empire Chapter: East Washington. Based in Spokane; includes Spokane, Lincoln, Ferry, Stevens, Pend Oreille, Adams, Whitman, Garfield, and Asotin counties. South Central Chapter: Central Washington south of I-90. Based in Tri-Cities; includes Yakima, Klickitat, Benton, Franklin, Walla Walla, and Columbia counties, plus the southern Kittitas and Grant counties and the panhandle of Adams. Southwest Chapter: Southwest Washington. Includes Lewis, Cowlitz, Clark, Skamania, Wahkiakum, Thurston, and Pacific counties. Olympic Peninsula Chapter: Olympic Peninsula. Includes Kitsap, Jefferson, Clallam, Mason, and Grays Harbor counties, plus the part of Pierce on the Kitsap peninsula. If you don’t feel the existing chapters represent your area, and you have sufficient cachers to support a new chapter on an ongoing basis, you may petition to form a new one. The WSGA Bylaws explain the requirements. If you’re interested, please contact a WSGA officer.